The current home of the original Tribe of Mic-O-Say is the 250 acres of Camp Geiger, two miles northwest of St. Joseph, Missouri. Mic-O-Say has thrived and provided leadership in that location since the camp’s founding in 1935. But Mic-O-Say and Camp Geiger share a heritage which began in a different century. Dr. Charles Geiger, who would donate the land that became our beloved Reservation, was born during the national mourning period for Abraham Lincoln, buried a short distance away from Geiger’s birthplace in Champagne County Illinois. By 1882, the Geigers were living on farm property near St. Joseph, Missouri, and the sixteen-year-old Charles were exploring the land which he would one day give to us at Camp Geiger. Click on a section below to view its content. At the turn of the century, a young man named Samuel Dunn Bartle had arrived in America from the United Kingdom. Bartle became a minister, and in 1898, he married Ada Mae Roe. On Tuesday, June 25, 1901, Ada gave birth to their son. They named the boy Harold Roe Bennett Sturdevant Bartle. By 1910, when the Boy Scouts of America was incorporated, Roe Bartle was eight years old, receiving his early schooling amidst the poverty and coal dust of Norton, Pennsylvania, a mining town. In 1911 a child was born on a Kansas train rolling toward Hays, Kansas. The son of Henry and Ellen Fiske, he would be known to Mic-O-Say Tribesmen as Chief Swift Spear, Finley F. Fiske. On July 16, 1916, the St. Joseph Council was formally organized. Eleven-year-old Simon Rositzky, who would become our beloved Chief Two Moons, counted the days till his twelfth birthday when he could join the Scouting Movement. Roe Bartle was by then a fifteen-year-old military academy recruit in Fork Union, Virginia. The future founder of the Tribe of Mic-O-Say, who would in later years possess the ability to speak extemporaneously to the delight of millions, the man who would become one of the nation’s most sought after public speakers, hid beneath his bunk in order to avoid attending a debating class. The young Roe Bartle was terrified of public speaking. In 1919, the St. Joseph Council received a first-class charter from the national organization, and John Tilden was employed as its first official Scout Executive. Scout Leaders embarked on a search for a suitable permanent summer camping area. Near Agency, Missouri they located an ideal site near the Platte River. 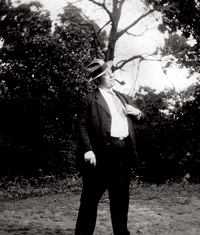 The owner, W. E. Brinton, eventually deeded the tract to the local Scout council at no charge. Camp Brinton, as it was known, would be the place in which Mic-O-Say would begin. In 1922, the 21-year-old Bartle joined the Scouting movement, accepting a position as the Scout executive for the State of Wyoming. American Indian heritage was interwoven into the Scouting program from its earliest days. In the early 1920’s, many Scout Executives experimented with Indian “societies” as honor organizations. The Order Of The Arrow, which would become Scouting’s national honor organization, saw its formation during this time. In the St. Joseph Council, a society known as Manhawka emerged under the leadership of O. J. Williams, its second Scout Executive. Manhawka inductees spent a night alone in the woods surrounding Camp Brinton, traveled on foot to nearby Bee Creek, there to find their new Indian names painted on rocks piled near the creek bed. They were offered a mysterious “black drink” as part of the induction ritual. Manhawka was loosely structured, not well organized, and few records exist regarding its membership. In Wyoming, Bartle became extremely interested in the heritage and culture of the many Indian reservations in Wyoming. 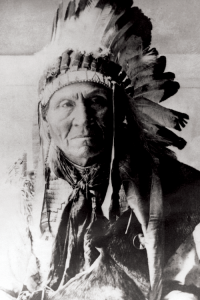 He spent many hours listening to stories about the Indian tribes and soon began to incorporate Indian values and ideals into his Scouting program. Bartle was inducted into a local tribe, and according to traditional Tribal legend, was given the name Lone Bear by the chief of a local tribe. In 1925, The St. Joseph Council was searching for its third Scout Executive. Bartle was offered the job, and arrived in St. Joseph in January of 1925. It is clear, from the nature of the Scouting movement and Bartle’s experience in Wyoming, that the idea of Mic-O-Say was well-formed from the moment he arrived. He familiarized himself with the rudiments of Manhawka, and incorporated them into his central theme of an Indian-like society based on the principles of the Scout Oath. Adding a fourth precept (one known to all Tribesmen! ), Bartle named the society Micosay. The popular hyphenated version of the name did not appear until later newspaper articles began to recount stories of Bartle’s Indians. While it is likely that the Indian based Scouting societies of the early twenties had their beginnings in Scouting’s national desire to incorporate Native American culture, it is also only fair to acknowledge that only a person of Roe Bartle’s insight and enthusiasm could have served as midwife to the Mother Tribe of Mic-O-Say as we know it. In May of 1925, the new Scout Executive awarded eagle claws to eleven adults during a ceremony at Camp Brinton. They were the first members of Mic-O-Say. The first regular induction of Mic-O-Say members began in the first session of summer camp in 1925 at Brinton. There were approximately 35 members selected in that first summer. Most new members were awarded a single claw and denoted as Braves, though an older, or particularly accomplished Scout or Scouter might later be elevated to the rank of Warrior. There were no Paint Stations at that time and there was no designated difference between a youth and adult member of Mic-O-Say. Braves wore the single claw, and Warriors wore two claws in the manner of Bartle, the down-turned double claw which today identifies an Honorary Warrior. Bartle made all decisions as to who would be inducted and elevated as a Warrior. Bartle was the Chief, and conducted all the early ceremonies personally, placing a claw around the neck of each new member and bestowing their Tribal Name upon them. During the next four years, Bartle would carefully nurture the new honor organization. Prior to 1928, he had conferred the title of Medicine Man on several of his valued Scouting Assistants, and had named several St. Joseph businessmen as Chieftains. These individuals, among them Wiley Cox, H. M. Nusser and E. H. Steffens, would assist Bartle as the ceremonies involved larger numbers of Scouts, and their tribal designations would be incorporated into the Paint Stations some twenty years later. In the fall of 1928, Bartle accepted a transfer. He would become the Scout Executive of the Kansas City Area Council. 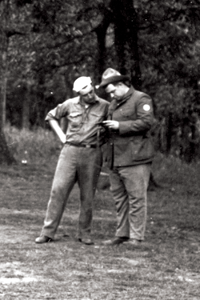 Mic-O-Say had become a vital, flourishing part of Bartle’s brand of Scouting, and he established another Mic-O-Say program at Camp Dan Sayre near Noel, Mo. That chapter was soon transferred to the banks of the Osage River near Osceola, Missouri. Since that time, many ideas and ideals of Mic-O-Say have traveled to other Councils throughout the United States, but only the two Tribes of Mic-O-Say exist today: The Mother Tribe at Camp Geiger, and the Tribe at the H. Roe Bartle Scout Reservation near Osceola, Missouri. A succession of Scout Executives in the Pony Express Council helped the honor society to grow and prosper. Among them were Rex Gary, M. N. (Red) Leavitt and Lester B. Miller. During the 1930’s, as Dr. Geiger donated the property for a new camp, Tribesmen found themselves transplanted to a temporary summer home at Camp Coronado in Eagle Springs, Kansas. The Mic-O-Say program continued to flourish. By the end of 1930, Mic-O-Say membership was approximately 160 strong. By the end of 1940, membership included over 600 Tribesmen. By 1947, however, it was clear to Scout leaders in the Pony Express Council that a restructuring of the Mic-O-Say program was necessary. A group of leaders including the Scout Executive, Lester Miller traveled to Kansas City to confer with Roe Bartle. By the summer of 1948, a young Pony Express Field Executive named William Frasier (Chief Medicine Man White Feather) was implementing the ideas Miller and his associates had borrowed from Bartle in Kansas City. Paint Stations, Honorary Warriors and the Council of Chieftains were introduced at Camp Geiger, and gradually gained acceptance with the existing customs and traditions. Much of the beauty of ceremonies today is attributed to Frasier’s influence during those tumultuous years of change. 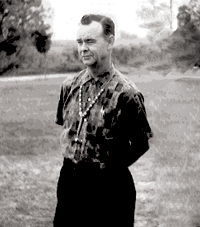 By the end of 1950, Tribal membership had grown to nearly 1400, and Don Weekley, a Camp Staff member, had become its first Hardway Medicine Man. In 1952, a new camp was begun high on the northern ridge of the camp. Wayne Taylor (Chief Medicine Man Fears No Wind) guided the Tribe through those early years in its new location. The Brave to Warrior Ceremony and paint appointments, which had been held early in the morning following the induction ceremony, were incorporated into the main ceremony. The following year, the peace pipe ceremony was discontinued due to the ever growing number of members. The pipe ceremony was reintroduced in 1980. Early in 1958, Lester Miller announced his retirement, and a search was made for a new Scout Executive. Finley F. Fiske, an assistant to Bartle in Kansas City, was interviewed and hired. He arrived on July 10 of that year. Fiske would be virtually canonized as the Scout Executive who popularized the Tribe of Mic-O-Say and Scouting in the Pony Express Council beyond the expectations of all who were involved. Fiske immediately named young Roger Thom, then a Sachem in the Tribe, as the Directing Medicine Man. Throughout the next eighteen years, Fiske and Thom worked together, bringing the honor organization to its zenith. Chief Swift Spear introduced several concepts from Osceola, including the Blood Brotherhood Ceremony in 1958. Scouting was in its most popular decade. A Dance Coup program was begun in 1964, and the Silver Coup was introduced the following year. The coveted Tapper Coup were introduced in 1971. Swift Spear, playing heavily upon his role as Chief and Thom as Directing Medicine Man Swimming Rock, strongly influenced by the solemnity of the Frasier years, doubled the membership of the Tribe by the end of the 1960s. By the end of their partnership at Fiske’s retirement after two decades as Scout Executive, Mic-O-Say membership had quadrupled to over 8500 Tribesmen. In 1980, the Lone Bear Coup was added. Ten years later, the Eagle Medallion was introduced. The Four Fires Award, which honors exceptionally outstanding adult Tribesmen, was first awarded in 1977, and the Two Moons Award, which honors an outstanding young adult Tribesman was fist awarded in 1993. Mic-O-Say continues to flourish. Many of Bartle’s original ideas and concepts remain, as does the influence of Frasier, Taylor, Fiske and Weekley. Certainly the story of the Mother Tribe is not complete without an additional acknowledgment of the remarkable leadership and authority of Roger Thom, the Directing Medicine Man for nearly thirty years. Swimming Rock’s indelible stamp upon Mic-O-Say, as well as his unique ceremonial style, can be observed in virtually every aspect of our ceremonials. At the Tribal Feast of 1987, Swimming Rock was elevated to the Council of Chieftains, and his role as chief in the ceremonies evolved throughout the next twenty years. At the same ceremony in which Thom was elevated to Chieftain, Ken Baker became Directing Medicine Man Little Pack Rock. From that day forward, Baker and his administration began to change the face of Mic-O-Say over the next twenty years. They implemented dozens of off-season and program improvements, including the Winter Conclave and its Planet Mic-O-Say theme and evening programs. The Fall Pow Wow was extended and improved, including the ever-popular Red Rock Monte games. Tribal Grounds were renovated on several occasions to include changes at PP, BB, The Conestoga Trail, SSB Point, The Four Stations, grandstand seating and a background wall at 4F. The TTB and Runner Retreats were introduced. Tribal records were computerized in 1987, and the Tribe was consequently able to support its organization with reports and needed data. Mic-O-Say joined the Internet Age with the addition of its website in 1996. As a result, Baker’s twenty year administration in Mic-O-Say brought unparalleled technological improvements and significant increases in new membership and Paint Station advancements. As time passes, and a proper historical perspective is achieved, the efforts of Little Pack Rock and his administration will likely equal those of Swift Spear and Swimming Rock, for having provided the Tribe one of the kindest gifts of all: survival. They guided Mic-O-Say into the twenty-first century. On July 21, 2006 at the last Friday evening ceremonials of the season, Chieftain Swimming Rock announced that he was “hanging up his war bonnet,” and would retire from his ceremonial role as chief. After approval from the Council of Chieftains, Thom then named the Directing Medicine Man, Ken Baker, to fill that role in future ceremonies. In 2007, Mic-O-Say moved forward under the leadership of Directing Medicine Man Walks Tall, Ed Stroud and a strong young administration of new Tribal Leadership. As a result of these and many other leaders, Mic-O-Say is nearly seventeen thousand strong. The Pony Express Council is among the top Councils in the nation in the number of Eagle Scouts each year. The council is consistently among the country’s highest with its ratio of Scouts who attend long-term camp. Our council also consistently wins top honors in program quality, and Mic-O-Say plays no small part in those honors. Our dancers are in demand at many Scout and civic functions, and have performed at both National and World Scout Jamborees. Eighty years ago, Roe Bartle had a vision. Today, his foresight is confirmed in a living testimonial to Scouting at its best. In the beginning, it was Bartle who came to us in the Spirit of Friendship and Leadership. And to the very end, Bartle was Mic-O-Say. In 1972, two years prior to his death, the Chief visited the Geiger Reservation to witness what would be his final Mic-O-Say ceremony.